STYX crystal petroleum is the crystal-clear premium lamp oil from low viscosity hydrocarbon. Due to the high degree of purity of the product, STYX crystal petroleum burns soot-free and with a neutral odour with correct wick adjustment. It guarantees optimum burning characteristics. Due to these characteristics, STYX crystal petroleum is superbly well-suited for indoor use. STYX crystal petroleum is available in a 1,000 ml bottle, whilst a 5,000 ml cannister is also available for bulk consumers. STYX crystal petroleum is produced from paraffinic hydrocarbons. These are very low viscosity and are quickly transported into the wick. 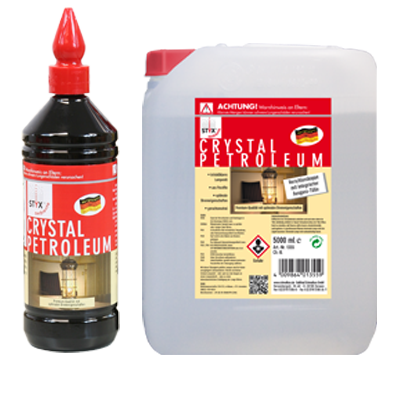 STYX crystal petroleum is therefore particularly well-suited for use in petroleum lamps. Characteristic of these lamps is the flame in a glass cylinder, the adjustment mechanism for the wick and flame height, and the relatively high suction height (distance between the wick tip and lamp oil).